Everyone loves turning their photos into canvasses to adorn their walls, so when Wallcreate contacted me to try out one of their canvas prints, I was keen to see what they were like. Having spent the previous weekend at our local National Trust property, I knew I had a picture of the children looking over the estuary that would be good to turn into a canvas for my wall. 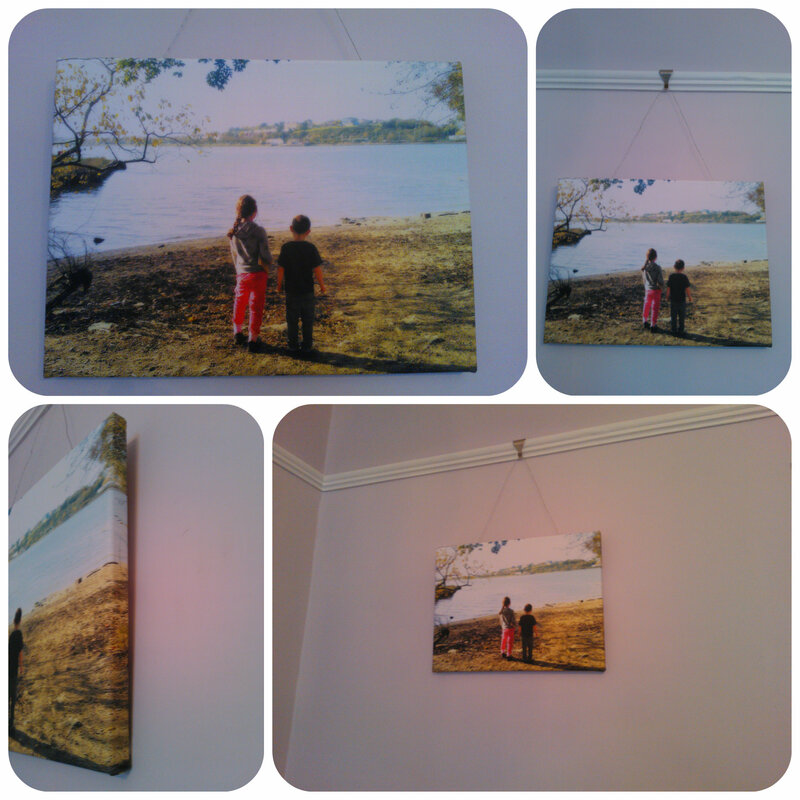 The canvas is 40x30cm printed onto high quality canvas cotton with a 2cm wooden frame. What I like about Wallcreate is the variety of options they offer you during the ordering service, from the different sizes of canvas, choice of 2 frame depths, choice of colour of the edge of the frame and various effects you can add to your picture. I’m really pleased with my canvas, it was hard to get a good photo to show you with all these dark days we are having but the picture is clear, just as in the original photograph. These canvasses are great if you have a photo you want to treasure and have on display or they also make a great gift to give to someone. All reviews are my own and my family’s opinions and we received the canvas in order to write the review. This entry was posted in Giveaways, Reviews and tagged canvas, giveaway, photo, wallcreate by Fiona Martin. Bookmark the permalink. i think it will be my kids photo! Lovely subject for your canvas, sounds like a good investment. I have a great photo of my niece that I would use and give the canvas to my sister for Christmas. a family photo! would be great for our new home with its plain walls! My two young adult children sat on a wall on a hill above Rome. I would have a photo of my husband and I standing by the Las Vegas sign as a token of a memory of the best holiday we have ever had. Photo of my home town, ready for my moving. Probably a wedding photo as we have none printed yet! I would have a family portrait – I have been wanting to get a picture for the wall in the dining room for ages! We took some really nice photos of our children recently so I would use one of those. My three nephews, niece and my dog Tia. Our dog at the beach. One of me, my husband, our son & our daughter when she’s born in March. Hi guys I am blind and therefore need to use the computer with the aid of specialized software, I would love to have a photo of my Guide Dog done professionally. I would love a photo of my daughter. A lovely photo of the 4 of us! I have a beautiful picture of Derwent reservoir and the moors that I’d like to see on a canvas! Its my favourite place! One of our baby daughter. A photo of my husband, son, and I. A happy, sunny pic from our summer holidays. It would be a family portrait! I’d have to get a lovely family photograph taken of us all. I would put a picture of my beautiful little girl. Would love a family one!!! My children – a happy scene from Christmas Day morning . One of my lovely family! I would have the photo of the moon over London bridge during the Olympics for my BFF as she has always wanted a print of it! I have got a gorgeous photo of my 2 daughter with their pony. I have hundreds I could choose, but it would definitely be one of our wedding photo’s.